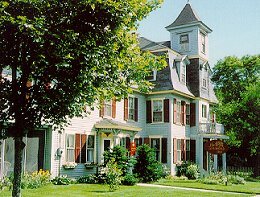 The Tamworth Inn, rated three diamonds by AAA, was built as a Country Inn in 1833 in the tranquil village of Tamworth, NH. The Inn is on three acres of grounds with lawns and gardens leading down to the Swift River which runs behind the Inn. Across the lane from the Inn is the village park with award winning landscaping and a skating pond. Next to the park is the Barnstormers Summer Theatre, the oldest professional SUMMER theater in the USA. Inside the Bed and Breakfast there are 16 rooms and suites all decorated with down comforters and antiques. The Inn also boasts award winning dining in its main dining room and seasonal porches. To top it off there is a cozy Pub with a unique collection of antique sleds. Come visit and enjoy a first class Country Inn in a village that has not changed in over 100 years. This and other Tamworth Bed and Breakfast Inns can be found here in The Register.